It’s easy to enjoy these services almost anywhere you like to watch TV. All of them offer live and on-demand programming to your computer, mobile device, smart TV or streaming media player—a convenience that cable just can’t match. If you’re looking to get rid of your pricey cable subscription, cable replacement services may be a good option. But watching television online still has some drawbacks. Here’s what you need to know before you decide to swap to one of these cable replacements. Though each service has its own channel list, channels vary by region, especially where the big broadcast networks are concerned. You may not get everything you expect. Even if you have access to a particular channel, you may not be able to watch it live. Again, this is more often true with the broadcast networks. DVR-style recording and on-demand service isn’t a given. Not every network offers on-demand programming (or on-demand programming for every show), and only one network on this list lets you record your favorite shows to watch later. DVR capabilities is something all of these services say they intend to add in the future; it’s just not something they all have now. You still can’t get cable programming à la carte, or at least not entirely. Every streaming service is a package deal, and you’ll probably wind up with plenty of channels in a package that you don’t care about. However, some of these streaming services let you upgrade with small packages of channels to get exactly what you want. It’s hard to get all of the major broadcast networks, even with cable replacement services. You may still need an HD antenna to keep up with your favorite shows. Fortunately, all of these cable replacement services offer free trial periods. Check them out to see if their channel offerings suit your needs. Where should you start? Let’s run through the features of the biggest cable replacement services to see which option is right for you. Sling TV is the original cable replacement streaming service. If you want just the basics, its $20-per-month Sling Orange package is the cheapest you can get. For that modest price, you get 30 channels, including some cable favorites: ESPN, AMC, CNN, Comedy Central, Cartoon Network, the Disney Channel and more. However, you’d be missing out on all major broadcast networks, which you’ll need to pay more to get (or use an HD antenna). The 40-channel Sling Blue package, at $25 per month, adds Fox and NBC but cuts ESPN and the Disney Channel. For $40 per month, you can get both packages (about 50 channels), but $40 gets you more on other services. (For $35, PlayStation Vue and DirecTV Now both offer 60 channels, including broadcast networks.) That makes Sling less appealing if you want more than the basic channels. Sling offers a multitude of add-on packages that let you pick and choose what you want. For example, for $5 per month, you can get a kids-focused package with nine channels including Disney Junior and NickToons. Premium channels like HBO ($15 a month), Cinemax ($10 a month) and Starz ($9 a month) are available as add-ons, but they cost exactly what you’d pay to subscribe to them separately; some other services offer discounts. The most appealing add-ons are for foreign-language programming. Sling offers a huge number of international channels, including a 39-channel Spanish TV package for an extra $5 per month. The foreign programming goes far beyond Spanish with channels in Arabic, Chinese, French, German, Hindi, Italian and Portuguese. 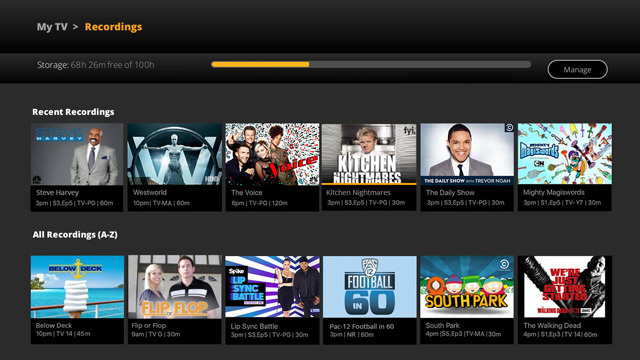 Sling TV is also rolling out a cloud-based DVR service, Cloud DVR. It's currently available on Amazon Fire TV devices through it's "First Look" program. It offers 50 hours of storage for $5 per month for any Sling TV subscription. You can record multiple programs at once without any conflicts. Sling TV will automatically delete the older watched programs to ensure there is always space. Unfortunately, if you add many of these add-ons, Sling’s price could balloon to the size of a typical cable package. If you’re looking for value, make sure you do the math before you sign up and load on the add-ons. 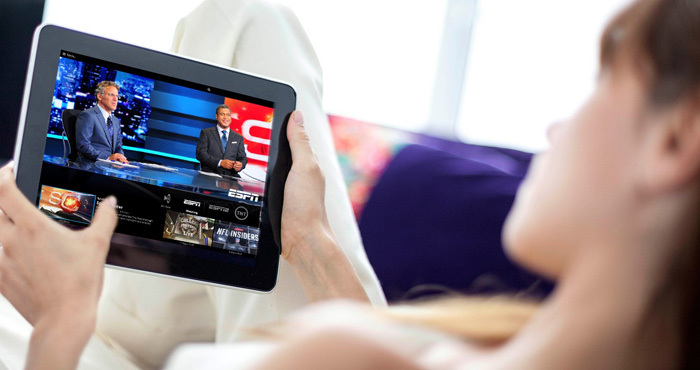 Price: Subscribe to Sling TV starting at $20 per month. 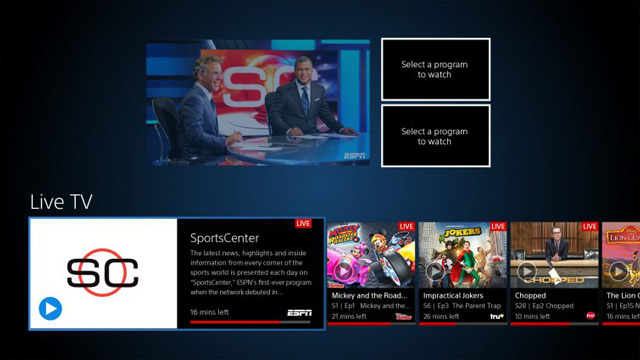 Despite its name, the PlayStation Vue streaming service from Sony doesn’t require a PlayStation to use. You can stream Vue content to your Apple TV, Android TV, Chromecast, Fire TV or Roku in addition to your computer and mobile devices. If you can spend a little more than $20 per month, PlayStation Vue offers good value — and it’s the only service offering CBS right now. Access ($30 a month) offers the best selection of broadcast channels you’ll find, including ABC, CBS, Fox and NBC. There are 45 channels in total, including AMC, CNN, ESPN, SyFy, the Disney Channel and more — a little something for everyone in this basic bundle. Core ($35 a month) provides 60 channels, primarily through adding more sports programming to the Access package. Elite ($45 a month) offers 90 channels including NFL Network and Epix for more sports and movies. Ultra ($65 a month) includes all 90 channels from the elite bundle plus HBO and Showtime. Those two channels would cost you $26 a month otherwise, so if you’re interested in both, you can save some cash with this bundle. The Access package is comparable to Sling Blue, but Vue wins out with more channels and more broadcast networks for just $5 more a month. If you upgrade from there, each tier offers a decent number of channels for the price, but we suspect many viewers will be happy with the low-cost $30- or $35-per-month packages. If you’re looking for more channels and you’re willing to pay, AT&T’s DirecTV Now may be what you want. Its highest-tier package offers a divers 120 channels for $70 a month, but you won’t get CBS from DirecTV Now. Another plus for PlayStation Vue is DVR functionality. You can pause, fast-forward and rewind live television and record your favorite shows if they aren’t available on demand. 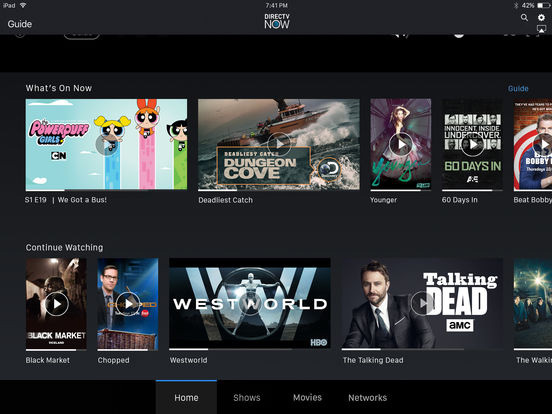 These features are in beta with Sling TV, and DirecTV Now intends to launch them some time this year. Until then, PlayStation Vue is the only streaming service to include this convenience. And, for sports fans, Sony just rolled out multi-view, which lets you watch up to three live channels onscreen at once. You can listen to audio for the main channel and view the other two. Price: Subscribe to PlayStation Vue starting at $30 per month. Live a Little ($35 a month) includes 60 channels with ABC, Fox and NBC in addition to popular cable channels like CNN, ESPN, AMC, FX, the Disney Channel, TCM and more. Just Right ($50 a month) provides 80 channels, including many regional sports networks. Go Big ($60 a month) offers includes 100 channels, making it a solid value in the $60 range (though remember, Vue’s $65 package includes HBO and Showtime). Gotta Have It ($70 a month) goes up to 120 channels. You can add HBO and Cinemax to any package for just $5 each, a solid discount from their stand-alone prices. This makes DirecTV Now’s basic offering a solid way to get HBO and a great selection of cable channels for a modest $40 per month. If you can get the channels you want, you could save a little money by pairing Sling Orange with HBO for $35. Beyond the lack of CBS, there’s another major feature missing from DirecTV Now: Roku support. CBS promises Roku and DVR support are coming this year, but neither are on deck yet. Price: Subscribe to DirecTV Now starting at $35 per month. While it isn’t available yet, Google’s upcoming entry to the cable replacement market promises to be the easiest way to watch broadcast networks online. For $35 per month, you’ll get around 40 channels. That sounds unimpressive on the surface; it’s less than you’ll get from PlayStation Vue or DirecTV Now for the same price, although it’s perfectly in line with Sling’s $25 Blue package. 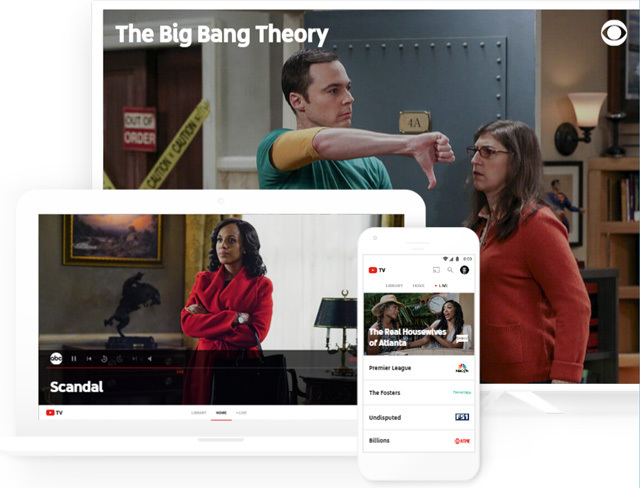 So what makes YouTube TV so great? It will include all the broadcast networks. You’ll be able to watch ABC, CBS, Fox, NBC and the CW. If you can watch a network over the air, you’ll be able to stream it over YouTube TV — goodbye, ugly HD antenna. DVR functionality will also be included out of the gate, a convenience that will give YouTube TV a big edge over Sling TV and DirecTV Now. However, while YouTube TV promises a good selection of cable networks in its bundle—including ESPN, USA, FX, the Disney Channel and more—there are some big names missing. There’s no CNN or AMC. The service’s announced add-on packages are also somewhat lacking, with only Showtime and Fox Soccer Plus available. You could subscribe to HBO on its own; other services offer to bundle it with your subscription for convenience, a feature you may or may not care about. However, YouTube TV introduces a snag for some streamers. While it will happily stream to your computer or mobile device, you can only stream YouTube TV to your TV via Chromecast. While a Chromecast device isn’t pricey ($30), this could be a disappointment for households that already rely on Apple TV, Fire TV, Roku or another streaming device. There’s no word yet on when YouTube TV will launch, but you can sign up to be notified when it becomes available. This is all driven by having available high speed phone lines for internet. In rural areas high speed is not available so we have it revert to having high speed dishes. With my $70 Exede package, I can only view about 4 movies a month without having to “buy more data”. When looking at overall savings, consider the additional streaming costs on your internet provider. At this point, we are waiting for AT&T to upgrade phone service to high speed. Why am I seeing such different prices? All of them $10 more per month than your article. I like your prices better. Just check the prices for rural Pennsylvania, which match yours. Mine are part of the tax for living in New York state. The reason that I still have high-priced cable, is that it comes with Phone and Internet. No-one is offering that package. Actually, you can get a “bundle” from AT&T for DirecTV NOW + unlimited wireless phone plan. They give you a $25 monthly credit. Yes, but you must add the dish, which can be a problem. DirecTV NOW is the streaming product from DirecTV. You only need high speed Internet. No dish required. I want to be able to pick the channels or channel types and not be stuck with a friggin’ boat load of not watched stuff. I just want a few channels - travel, science, a bit of comedy, and cartoons that kind of thing. Usually my list is maxes out before I get to a full 10. I don’t see any reason that this few channels needs to be $20+ a month. Give me a scale or set price reasonable for 5 to 10 channels. I already have Amazon prime on the firestick - I don’t need anything except a few that Amazon doesn’t carry ‘yet’. I’m an early adopter, got $50/mo unlimited high speed phone/data (Simple Mobile prepaid no contract 30Mbps speed, which is plenty bandwidth to watch my DirectTVnow ($35/mo) anywhere I go and Chrome cast it to my TV at home. So for a total of $85/month I’m already set up wirelessly with no contract, no hassles, no BS. Wish ya all good luck! And remember 5G is coming soon!! I need a dvr tv box to anable me watch tv channels. text me at 360-390-8921. Why so much sports networks? Some like sports only, some want none of it. Why not offer a fat sports package for a small fee and leave it off other pkgs?